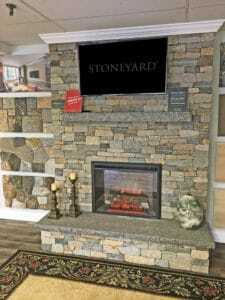 Is Stoneyard™ Thin Veneer real stone? Yes. The stone was formed in New England and the East Coast of the U.S. during the last ice age. It is as real as it gets. What books are available on working with stone and stone walls? “The Granite Kiss: Traditions and Techniques of Building New England Stone Walls” by Kevin Gardner, et al, available in book stores and at Amazon.com. “Ten Landscapes” Stephen Stimson Associates ISBN # 1-564-96-858-8 $25.00 Available at Amazon.com. See more book recommendations on our book page. What installation system do you recommend? What is All Natural “Real” Stone Veneer? All natural stone veneer is “real” stone that has been split and sawn to be approximately one (1) inch thick. It is used as a wall covering for exterior and interior surfaces. Our Thin Veneer is crafted from natural stones that are native to New England. 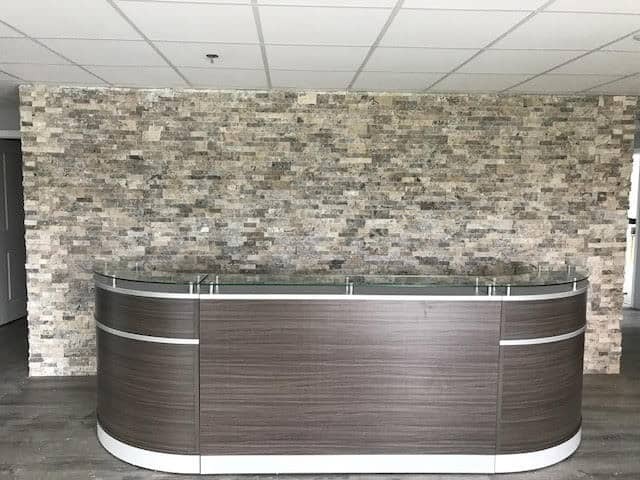 Stoneyard Thin Stone Veneer is perfect for interior or exterior projects because it weighs less than 14 lbs per square foot for ease of shipping and installation but it has the durability and beauty of real stone. Real stone has been formed by glacial and volcanic activity over millions of years which means that the colors on the surface are present throughout the entire stone. This allows the mason to “shape” the stone during the installation process creating the perfect fit and style. Because the stone’s color is contained throughout each piece, this stone will last 100’s of years and will continue to increase its natural beauty as a patina (a surface grown beautiful with age) develops from the sun, wind, rain, ice, heat and cold. What other names are used to describe Natural Thin Stone Veneer? Why is all natural stone veneer used? Exterior and Interior Wall Coverings to protect the structure from the elements and to provide beauty and decorative appeal to the surface of the structure for architectural construction projects. What are some examples of where natural stone veneer is used? Any place that wood, brick or stucco or man-made should could be used. Visit Stoneyard.com’s online searchable natural stone photo gallery for inspiration and ideas for your project using All Natural Real Stone Veneer from New England. What is Stoneyard™ Boston Blend? Is it a specialized blend? Controlled blend? It is a generalized mix of dense quartzite conglomerate and granite natural stone found in New England. It is by far our most popular natural stone thin veneer. By using a blend of colors, it goes visually with many adjacent colors and is the perfect stone blend to choose if at some point in the future the adjacent colors may change with a new home or business owner, or a new generation of your family. Watch as David Croteau of STONEYARD® demonstrates the use of some amazing new Thin Stone Veneer installation tools: Thin Stone Veneer Hammer and Steel Base Splitter. Our most popular thin veneer stone is crafted from natural stone from farms/quarries throughout New England within 100 miles of Littleton, MA.